Almost 50 years ago, in the classic 1968 Peter Sellers movie, The Party, a bumbling Indian actor gets into mischief with electronic technology at the extravagant home of a Hollywood movie producer. During the course of the evening, he playfully vocalizes gibberish over the whole-house intercom, triggers fountains to spew water at inappropriate times and activates moving walls and furniture, creating chaos and making for great comedy. This high-tech home was likely inspired by a Walter Cronkite TV show from a year earlier, titled The 21st Century, in which the venerable journalist explored the wired home of the future. Amazingly, much of the emerging technology predicted in 1967—such as multi-room audio, 3D TV and home automation—is mainstream today, albeit more sophisticated. For one, the desk-sized central command console has been replaced by a simply designed touch-screen control panel about the size of a tablet. Welcome to the second decade of the second millennium. The “smart home” industry in North America has skyrocketed from an estimated $1.3 billion in 2007 to well over $10 billion today. Virtually every automated device and system you can imagine is out there or being developed as we speak. Although it is unlikely that we will be living The Jetsons lifestyle in sky-high space pods and zooming around town in flying cars, the growing popularity of quadcopter drones and the emergence of self-driving cars makes anything possible. Even Star Trek’s Holodeck, a holographic environment simulator where users could interact with computer-generated beings, seems like a possibility for every home entertainment room in the not-too-distant future. Peering 50 years on, though, poses multiple challenges. Assuming we don’t blow ourselves up first or lay waste to the land via some infectious disease, the world will evolve far beyond our current “internet-of-things” electronic connectivity. Wired magazine, the online authority on the latest in high-tech gizmos and systems, interviewed academics and business people around the world to get their views of what we can expect on the homefront. Here is a sampling of what they had to say. Homes will become intelligent enough to distinguish between family members and guests, adapting to their individual needs and comfort preferences (lighting, room temperature, music) by their fingerprints, body temperatures and even their heartbeats. As people age in place, our homes will give reminders and help with tasks like cooking or cleaning. Personal-service humanoid robots, guided by sensors, cloud computing, radio-frequency ID stickers and infrared bulbs will help with chores but also socialize with occupants. On the personal front, home technology will conduct early diagnosis and constant monitoring of our physical and mental health. Smart homes will enable us to shift walls so that we can change our living space as required. We won’t buy products online; we’ll buy designs that we download and make at home with our 3D printers. Digital content and services, distributed on dedicated terminals like tablets, will become ideal companions for all activities in the home, such as gardening, cooking, DIY and entertainment. BoredFactory also cites a robotic vacuum cleaner that visualizes rooms in 3D, then charts its cleaning patterns, a hand-held washing machine that scans clothes for bacteria, washes them and irons them with one touch and an in-home clothing printer that allows you to design a new wardrobe. 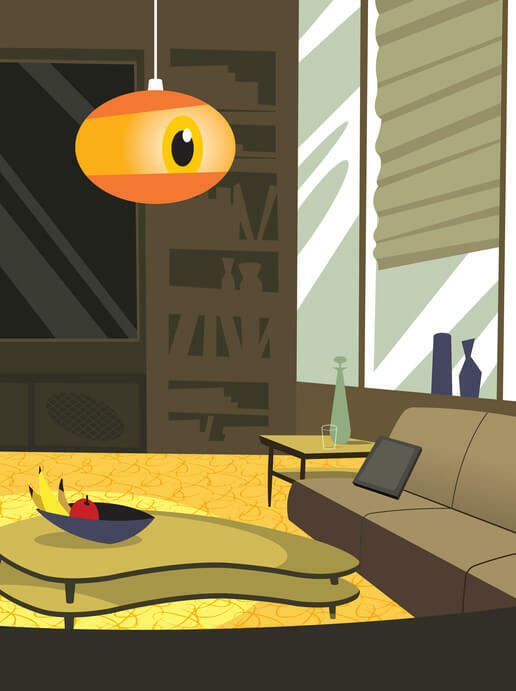 In addition to technologies, what will other features of a family home look like in 2066? 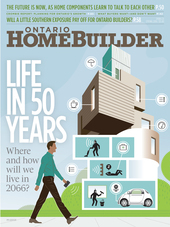 To answer this question, Ontario Home Builder magazine spoke with three thought leaders to get their views on the subject from their varying perspectives of architecture, urban planning and residential building. McGill University School of Architecture Professor Avi Friedman, an internationally renowned housing innovation expert and futurist, is an architect who regularly contributes housing insights to OHB. Looking into his crystal ball, Dr. Friedman believes that homes and communities in 50 years will be guided by four major influences: technology, demographics, the economy and the environment. Our kitchens and bathrooms will also be doing a lot more, Friedman contends. “We will be growing food in the kitchen. Fridges will have climate-controlled compartments that cultivate live food such as herbs and mushrooms,” he says. “The large exterior surfaces of the fridge will be used for other tech applications, and kitchens will be better adapted to recycle materials.” Elsewhere in the home, he foresees functions designed to relieve stress, such as bathrooms that will be more like spas, transforming themselves into relaxing natural environments. Keesmaat strongly believes that today’s model of suburban development and its required infrastructure will be a thing of the past in 50 years’ time. “As we become more environmentally conscious and as municipalities realize that the fiscal reality of going into deficit to subsidize this type of housing is no longer sustainable, a more urban, user-based model will take its place.” She adds that the sub-prime mortgage crisis of 2008 was largely due to highly subsidized residential development. What about the structure, size and environmental sustainability of homes in 2066? Friedman proposes that many of the features and advancements now in place will be common, with the exception of traditional wooden two-by-fours, which will be composed of “wood and something else, like a recycled material.” As homes become smaller, he says, accessory spaces such as basements and attics will become used more as extended living spaces with windows and proper lighting. And if the future predicts automated electric vehicles, where required, and fewer cars for the urban population, what is the future of the common garages? Citing Minto’s upcoming BSide at Westside Toronto condo project, where infrastructure will be built to charge electric vehicles, Baker believes that garages in their current form will disappear. “Because zero-emission vehicles don’t burn fossil fuels, they can be safely stored inside a home,” he explains. The year 2066 is a long time away. Just as we have seen significant changes in the construction of homes, the design of communities and our very way of life over the past 50 years, it’s safe to say that how we live, work and play will be very different 50 years from now. Factoring the economy, demographic changes, the shifting environment, the lightning pace of technological innovation and the doubtless political conflicts the world over, it is difficult to predict the world five years from now, much less 50. At the very least, homes of the future will need to provide a safe sanctuary for personal and family time, away from the hustle and bustle of a fast-paced world. It may not be the pie-in-the-sky future of The Jetsons, but we could certainly handle a Star Trek Holodeck in every room.